In Part 1 of 2 in our one-day series on change – or lack there-of – within the Union organization, Tim Jones gives his thoughts on the Union’s top-to-bottom system. Look for a more statistical analysis from Chris Sherman in part 2 later today. 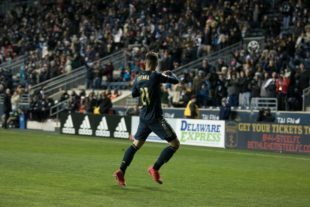 As Peter Andrews and others have aptly pointed out, the schedule makers played a role in the successes of the Philadelphia Union’s two teenage debutants on the club’s opening night, successes in which we can all rejoice. While Brad Friedel’s New England had some successes late in preseason, they seem still in the midst of a rebuild. “The template” dictates that all teams in the Philadelphia Union organization be coached to play the same system the same way, from the first team to the Steel to the Academy. Much angst has been directed at the template from the beginning of the Earnie Stewart and Jim Curtin organization reboot that many call Union 2.0. Its inflexible lack of adaptability, its forcing of square pegs into round holes, has bothered all the youth coaches among us whose teaching stock in trade has been to identify the 11 best soccer players available and discern the tactical system that displays their strengths and hides their weaknesses. Last week on the evening of March 3, 2018 , we all saw the benefit of a single template permeating the organization at all levels. It creates seamless transitions. Anthony Fontana and Auston Trusty had no hesitancy what so ever about what to do, when to do it, and the manner in which it was to be done. Mental muscle memory, if readers will forgive the phrase, was already fully developed. The kids belonged from tap off. We suspect we will see such seamless transitions in the future from the Mark McKenzies and Matt Reals lower down in the organization. They were manifest in their Steel debuts. This writer’s responsibility is to cover Bethlehem Steel FC. This fan’s civilian entertainment interest is in Philadelphia Union. This old history teacher has been slow to fully realize the positive impact the mental muscle memory can have on a young soccer player making his first-team debut. Without doubt other factors contributed to Fontana’s and Trusty’s success. Trusty mentioned his experiences in other “big games,” like last season’s CONCACAF qualifying and U-20 World Cup in South Korea. Coach Burke’s first assessment of Fontana at Nippert Stadium, Cincinnati in 2016 stressed his fearlessness. The template has frustrated the dickens out of many of us with its rigidity. And then two teenage boys come onto the senior pitch to play among men, and neither one behaves nor looks like a teenager. The template helped create that. i’ll speak for myself: As much as the rigidity of “the template” has been tough to take, the real thing that has gotten me is the inflexibility of squad selection. As Steve said in his column yesterday, the squad rotation has been so predictable, if it happened at all. I know there have been depth issues, but you can’t run CJ Sapong and our contingent of 30+-year-old midfielders out every game, especially in weeks of severe fixture congestion, and expect it to have no impact. If Curtin, as he promised, is sure to work Fontana and Burke (based on game 1, he’s my #2 choice up top) into the lineup regularly, I’m happy. Rotate the squad. If Curtin doesn’t manage/rotate the squad better this year, I have no confidence that he can or will be able to in the future. Definitely check out Chris Sherman’s Part 2 coming soon. Almost every spot has a guy this year that you feel ok throwing out there and a bunch have guys you want to get minutes/see how they do. So it better happen. Nice work Tim. You made some really good points. I was/am one of those that doesn’t want to hear it’s too tough to switch systems. This stance deserves some reevaluation. I think as long as you are able to tweak things within your system based on opponent/form it can work. If you just want to do the same thing every game then it’s going to get eaten alive. Hopefully with better players this year they tweaks can be more substantive and most successful than in the past. This takes me back to the start of last season where they said they “tried” a few looks, but “the players” weren’t catching on. It all comes back to coaching. Curtin spent the formative years of his coaching career in this system, so that’s all he knows. I’m not sure most people here think the idea of a system throughout is bad. We’re more concerned with not being able to manipulate it at all in specific situations. Your Point is valid for sure, but there’s much more sample size showing that it’s far from perfect as opposed to this one game the kids played great.